Buying a home is a serious blow to the family budget, and therefore a reason for saving. So now, if we have a need for new furniture, I try to make it myself. 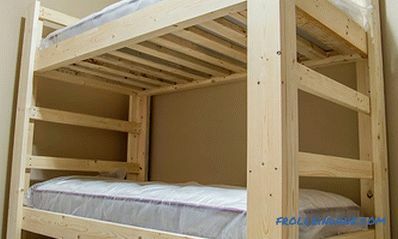 Since relatives are probably visiting us for the holidays, I was puzzled by the question of how to make a bunk bed with your own hands (such a bed is the best option for a not too spacious guest room). I decided not to invent anything new, but to reproduce the construction that I had already done, if my memory serves me, four or five times (and they all turned out great). What I really like about this bunk bed is that absolutely all the fasteners are located on the inside. This means that the not so elegant heads of the self-tapping screws or the bolts that you usually see on the outer surfaces of such beds are hidden in this model. In addition, the list of materials needed for the construction of such a bed is limited to 5x10 cm and 5x15 cm boards, which means that the vast majority of people will not have difficulty at the preparatory stage of the project. So, now be careful: I’ll proceed to the description of the construction process itself. I hope that the photos of the bunk bed accompanying my story will help you to understand all the details of this project and make my explanations as clear as possible. I do not give the size of the beds because they will depend on the size of the mattresses that you are going to use. At the same time pay attention to the fact that the mattresses themselves should easily fit into the frames assembled for them, but should not hang out there. 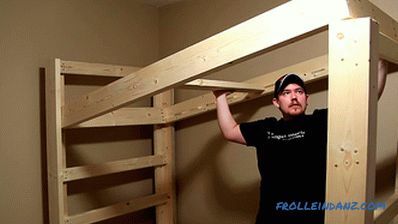 Bed frames should be made first, because their width determines the length of the steps of the stairs. 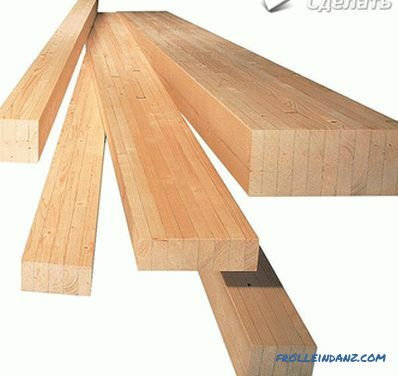 Ordinary pine boards with a section of 5x15 cm are suitable for making frames. I want my creation to have a slightly aged look, so do not try too hard when grinding. I do not need the wooden surfaces to be super smooth, but it’s still worth removing the factory tags from the wood. 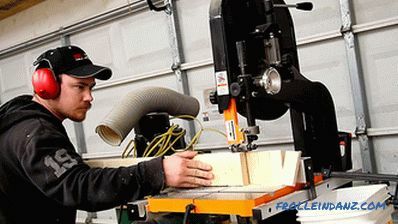 To speed up the process, I decided to use not a grinding machine, but a planing machine. Several passes, and from the factory stamps there is no trace. 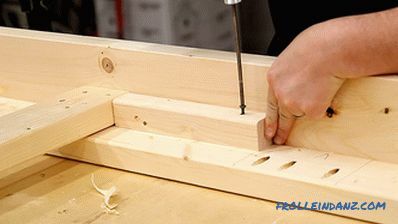 The frame parts are assembled together with wood glue and screws, using a slanting joint to flush. They will be hidden by mattresses, and no one will ever see them. For the manufacture of secret holes at an angle using a special tool. Then a screw is screwed into each hole. To maintain the river bottom, bars with a cross section of 5 * 5 cm are needed. However, it turned out to be cheaper for me to buy 5 * 10 cm bars and make 5x5 cm of them from them. They are glued and screwed to the walls of the frames from the inside. Usually, a removable rack bottom is made of strips 2. 5 * 10 cm or 2. 5 * 15 cm. For single mattresses such dimensions can be considered optimal. But I managed to buy 5 * 10 cm boards cheaper per linear meter than 2. 5 * 10 cm. In order to slightly reduce the thickness, and at the same time increase the stability of the slats, I made cuts at the ends of each. 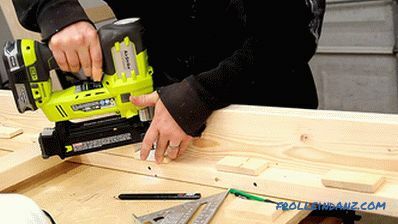 I made a couple of tools with which you can easily make cuts using only a circular saw. The first device will help make the cut 13 mm deep. 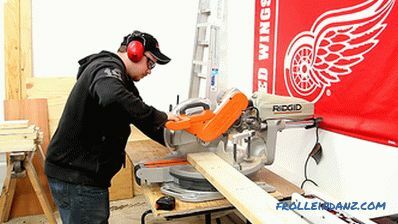 The second one will come in handy when you make perpendicular cut. 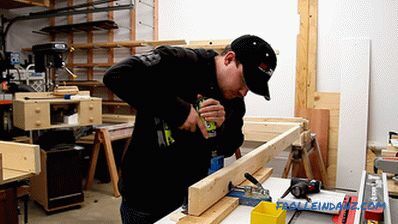 This is just a piece of plywood with a wooden gasket, which is fastened with a clamp to the end of the rail, which allows you to accurately determine the position of the saw blade. 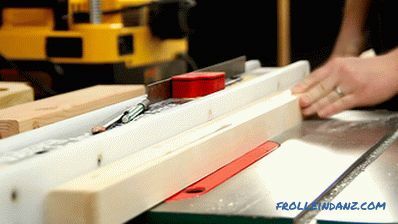 As a result, you can make neat and identical cuts (and you will need the cut bars at a later stage). I made these two devices for the sole purpose of showing you that for the implementation of this project there is no need to purchase expensive tools (band-saw or a cutting machine with a table). 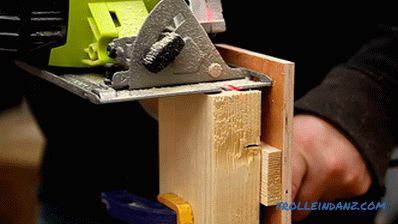 All necessary cuts can be made with a simple circular saw. 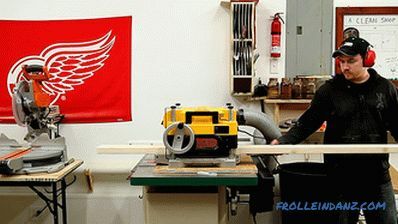 In fact, it was just a demonstration of possibilities, but I myself made the rest of the cuts at the ends of the slats using my band saw. The first stackable level is the central one. This is the only strap that is attached to the frame with screws. The rest are not fixed. 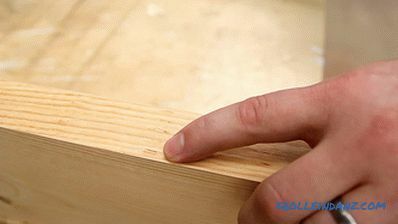 Then small wooden sticks are glued to the supporting bars and nailed with parquet studs - trimming pieces left after preparing the slats for the bottom. 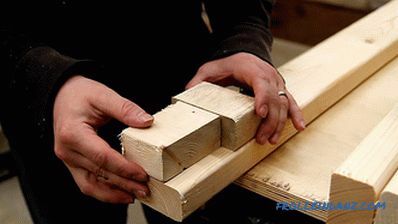 The purpose of these spacer blocks is to prevent the shifting of the battens forming the bottom of the beds. The frames are ready, now you can focus on the legs. For the manufacture of each leg, having an L-shaped, 5 * 10 cm and 5 * 15 cm boards are joined at an angle of 90 degrees. 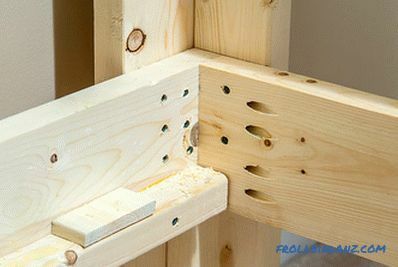 The distance between the screws fastening them, screwed at an angle, is important, although it does not particularly affect the strength of the structure.Simply place these screws so that they later become hidden stairs. When the legs were ready, I realized that the boards I bought on the cheap 5 * 15 cm were not of the best quality. Most of them had numerous notches left by the rollers of the mechanisms moving the lumber on the sawmill. To remove them, I used my face plane (but now I realize that I should just cut off the defective side on the cutting machine). In the next step, I made blanks for the steps of the stairs. Aligning the surfaces of the boards that make up the bedsteads, I actually lost 3 mm of the width of the stairs. 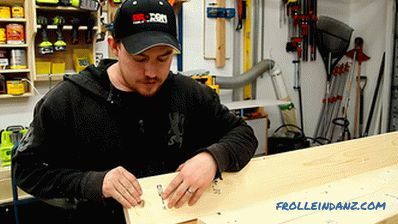 The steps will be fastened to the wider part of the leg, and so as to hide the holes of the self-tapping screws fastening the two forming the leg of the board. I used a pair of spacer blocks to determine where to drill the guide holes. 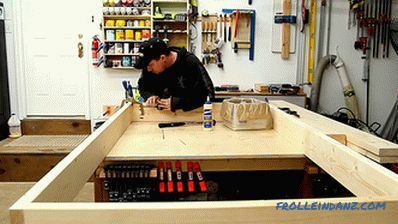 The steps are attached to the legs of the bed with glue and screws. The main thing at this stage - do not forget to ensure that the steps are located strictly perpendicular to the legs. Now it is necessary to fix small wooden blocks on the legs, which will be supported at the proper height of the bed frame during assembly. At each corner of the frame you need one such bar. I thought that I would have to puff a lot while assembling the frame, but it turned out that it was very easy. To begin with, I inserted one side of the bottom frame into its place and fixed it with a quick-release clamp to hold it in the desired position. Then did the same with the other side. 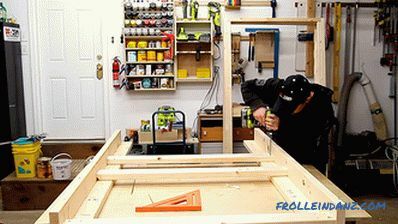 Since at this stage the lower frame of the bed was held only by clamps, I was able to easily install the upper frame, alternately loosening one or the other lower clamp. I also temporarily fixed the upper frame in place with clamps. Each inner corner of the bed frame was attached to the legs with 8 screws - two are screwed into a 5 * 10 cm plank and six into a 5 * 15 cm plank. 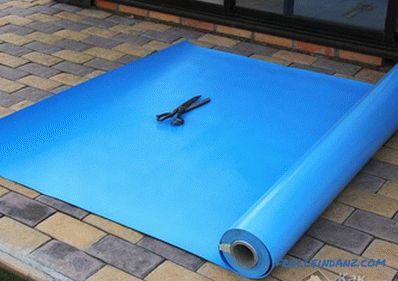 This may seem a bit redundant, but it guarantees that the frame will not loosen over time. Of course, during the dismantling of the bed for transportation, all these numerous screws will have to be unscrewed, but since 99.99% of the time the furniture performs its direct function, and is not in transit, it is not so scary. 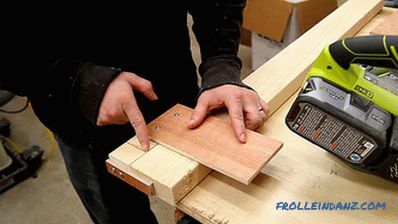 You can start laying the bottom slats. I must say, they turned out to be quite strong: each withstand easily my weight of 85 kg. I have no idea what the maximum permissible load on the bunk bed I have made, but it should turn out to be quite large, because the weight of the person lying down is distributed evenly among all the slats. Since both end walls are a staircase, it doesn’t matter how you position the bed - you can get to the upper tier from either end. I did not make a fence on the top bunk, but if you feel the need, you can easily add this element. 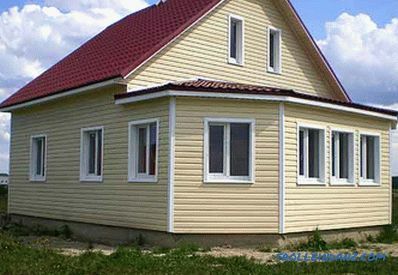 I have not done the finishing treatment of wooden surfaces. I want to experiment with a metal sponge, vinegar and composition for tinting wood BRIWAX, but it will be a little later. I hope that you could find inspiration in my project description and are ready to make a bunk bed out of wood with your own hands. Believe, it is not at all difficult to build a reliable structure that will serve you for many years. 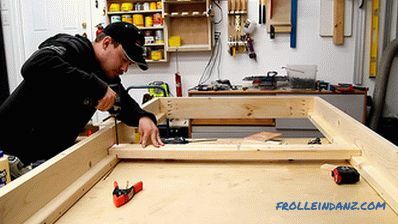 Making your own furniture will allow you to do exactly what you wanted, rather than what the designer at the furniture factory intended, and at the same time save a lot of money. Regardless of whether you decide to build the same bunk bed as mine, or embody your own ideas, I wish you good luck!